OMG that red-headed girl is gorgeous! Is she the real Rose Red or Carmilla? That’s Carmilla and she is half Rose Red and half Snow White. So both! Who is the real sloth then? My guess is one of the Snow Queens or maybe even Gothel since Rapunzel will be a big part of the story. I hope we get more of Jafar as well! I really like how the more the tension between them increases, so do the shading. Dorian looks really scary in that last panel. Still, it would be really interesting to see an alliance between them. I don’t remember Dorian saying he can’t ever lie. I think that is Carmilla. Carmilla can only tell the truth. Whoops! I probably misread the part about who was honest in the previous chapters. But then that means Grimhilde really was the one who offed Rose Red then instead of one of the goddesses? And Carmilla told Rose Red (who she called Snow White for some weird reason) that her mother was the one who was responsible for her death. Was she really talking about Snow White, or was Carmilla indirectly talking about the 2nd one, the “original” mother of “Rose Red,” making what Dorian said to Quetzal kind of true? I see. I understood that Grimhilde had a hand in Rose Red’s death because she told her that she controlled the huntsman who apparently did the deed ), but I guess that might change in the rewrite so what Dorian says will make more sense. Both things are right. 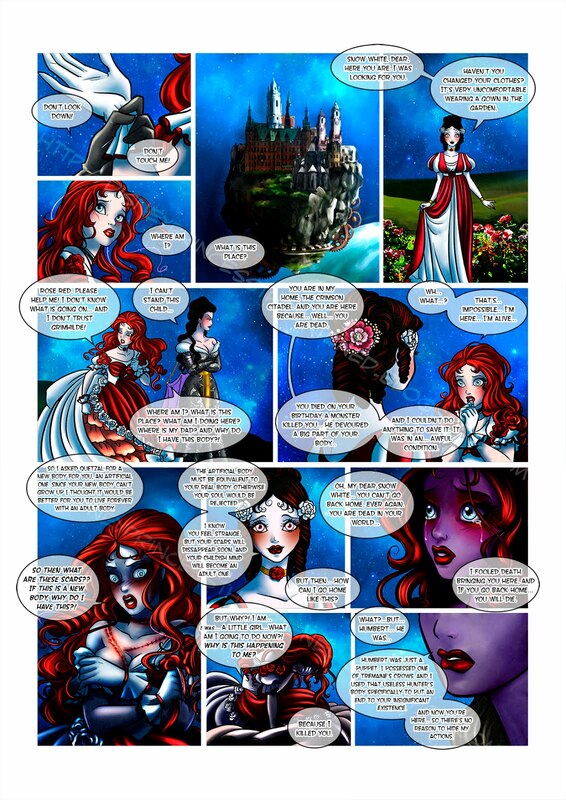 Grimhilde killed Rose Red because she was influenced by the goddesses’ desires. They are goddesses after all, their methods to kill people are different, all the bad and good things happened because they wanted to, but things are a little different now:). Was it just the First One who wanted Rose Red dead or was it both the goddesses? Oops, I mistook which Rose Red you meant in the first sentence. I thought you were talking about the Rose Red who was Grimhilde’s infant daughter which is why I said that Althea was responsible for killing her. But you meant Snow White’s daughter, Rose Red! I hope we get a flashback to when the last Snow White and Rose Red killed themselves and why. Wasn’t it the one where Snow White accidentally saw a glimpse of Carmilla’s past self and the blonde Rose Red? Maybe that Rose Red was driven to the point of suicide by something before Carmilla could reunite with her, and she herself committed suicide not long after? Anonymous is right. The Carmilla’s flashback was a portrait of the moment they commited suicide :). So Snow White was red-haired then and Rose Red was blonde in their previous life? Lol, this means that Carmilla is technically in love with herself since she is half Rose Red. Probably it is the Snow White side of Carmilla that is in love with Rose Red. Would that be why our Rose Red respects Carmilla more than her own mother? She literally can’t feel anything for her? The art style looks different in this page, especially for Quetzal. I like how disturbed Quetzal looks in the third panel. You can interpret her reaction to Dorian’s revelation as either how ridiculous it sounds or that it actually sounds valid. The coloring on this page is so beautiful! It really fits the tense moment. Know we know why Carmilla hates Dorian. She is half Rose Red and Rose Red hates Dorian. Carmilla looks like the love child of Snow White and Ariel. All this time I thought Queztal was a mixture of both, one of the seven sins and a Dreamer–could she quite possibly have never been one of the sins in the first place? If so, who is the true sin? So Carmilla really is a mixture of Snow White and Rose Red. Yes, it has been confirmed on this page that Quetzal was never ever a sin in the first place. She has been pretending to be one this entire time as an undercover agent but Dorian has in fact known all along! So she literally is a “sleeper” agent! Lol that name makes sense now! When will Dorian finally meet Snow White? In the next chaoter :). Wait a minute. Does this mean that the rose Carmilla gave to Ariel was actually meant to lead her to Snow White??? She said they were supposed to help her FIND the one she loved, NOT be given to the one she loved. She even said that she was pleasantly surprised that she happened to see Ariel again, not that she felt like her other rose led her SPECIFICALLY to Ariel. The other rose led her to Rose Red, after all. You are totally right :). How did Carmilla know that giving the rose to Ariel would lead her to Snow White? And since Snow White is Rose Red’s mother, wouldn’t it be easier to get to Snow White through Rose Red? There’s also Grimhilde’s infant daughter, another Rose Red. Not to mention Ariel is called that as well by Carmilla. Perhaps not everyone is like that. Which good or bad guys? Maleficent and the other villains are still acting like jerks (to put it mildly) whereas Briar Rose and the others haven’t really done anything yet to merit evil behavior. Do you mean the 1st, 2nd, and 3rd one?? Dorian is saving Snow White. Rose Red is evil I think since Dorian hints something wrong with her. Quetzal we thought was sin but really she good guy. Carmilla was helping villains but now she is Snow White 2.0 so good. Aurora goes from princess to sword swinging rage princess. Guinevere is good in myth but evil here. Morgana is evil in myth but good here. Lol, I think you have it all but I don’t think it was ever confirmed that Carmilla is also in love with C!Snow White. Right now, she was interested in meeting her and hugging her but her affection has all been for Ariel. Ok, so everything above EXCEPT for Carmilla loving C!Snow White; at the most Carmilla is fascinated by her. So does that mean F!Snow White embodies innocence while F!Rose Red embodies intelligence, or visa-versa? What does Dorian mean when he said “Part of (P! )Snow White’s soul stayed inside (P! )Rose Red, separating her most innocent side from the most intelligent” ??? If Carmilla is one part P!Snow White and one part P!Rose Red, does that mean P!Snow White had blue eyes and P!Rose Red had red ones (being an albino with pinkish eyes?? ), or that Carmilla has P!Snow White’s hair and P!Rose Red’s eyes? Which physical parts combined to make up Carmilla?